Choosing an oil filter is very difficult. Typically, nothing other than visual preference and marketing power will tell you which one should be used and which should not. I have seen many pictures of cut away filters used to back up claims as to why one filter is better than another, but these are really meaningless points. A filter that visually seems to be sub-par may in fact out perform another that looks the part. Without testing, we really cannot know which filter is best. The amount the filter restricts the flow of oil into the engine. At what pressure drop does the bypass valve open? The presence of an ADBV. Will it fit onto the vehicle? The last two criteria will be obvious. The first two require some specialized laboratory equipment to test. But the middle two are testable with a little plumbing and a little planning. Why do we want the least restrictive oil filter? Simple, a greater quantity of oil supplied to the engine at higher pressures ensure that the engine will be protected as well as it can from the great loads and heat running through it. Let’s assume that oil is pumped from the oil pump at 90psi at a flow rate dependent on the thickness of the oil. The oil then passes a pressure relief valve within the engine cases. This valve will regulate the oil pressure going into the filter so that it does not exceed some desired pressure. Let us assume that that the pressure relief valve is set to prevent the oil pressure going to the oil filter from exceeding 75psi. The oil is then pushed through the filter and its media. When the oil is being filtered by the media, a pressure drop will occur between one side of the filter and the other. This may bring the oil pressure supplied to the engine down to 70psi. If the pressure differential across the oil filter is too great, the filters bypass valve will open, allowing oil to avoid the filter media and go directly to the engine without being filtered. This is usually not a big concern as this typically only happens for a short time when a cold engine is started and the oil is still quite thick, but, it can also happen if the filter becomes clogged, a big worry, or when the journal gaps have been opened up through wear or by the engine builder to reduce parasitic internal friction losses. So, the engine is getting oil delivered to the engine at 70psi and at some rate. This oil is the life blood of the engine. It must arrive at the bearing journals with enough pressure to support the spinning shafts so that they do not bump and scar the delicate bearing surfaces and journals. The oil must also be flowing at such a rate that fresh cool oil arrives before the oil in the journals overheats and fails. In a high performance application such as a sport bike engine, extremely great loads are passing through the engine and a lot of heat is being generated. We want to ensure that the oil filter is allowing the oil to do its job as best it can. This means that we want the least restrictive oil filter capable of the highest flow rates possible. Just so that none of this is too easy, we also want to have the oil cleaned as well as possible. Particles of just a few microns (1 micron = 0.001mm = 0.00004 inch) can cause engine failure when the engine is being pushed hardest. Luckily, we take very good care of our bikes and the oil in them, and the fact that as the engine oil passes through the filter over and over, and gets cleaner and cleaner as the engine runs. An adequate 3 dimensional media must be present inside the filter for it to trap all of the microscopic particles. What other measures can we take to increase flow and pressures to the engine? Two primary ways exist for this other than changing the oil filter. We can preload the pressure relief valve placed before the filter so that it supplies oil to the filter at a higher pressure. This is of course very tricky as it requires disassembly of the entire engine. Also, if the pressure supplied to the filter is too great, either the filter media can fail or the filter housing may burst. We can also use less viscous engine oils. This oil will pump through the media easier reducing the pressure drop, and will flow quicker with less frictional losses within the oil itself. Thinner oils are also inherently less robust and produce a less protective film over the engine parts. Great care should be taken when choosing suitable oils for this change. The thinner oils wear the engine more in time and necessitate more frequent engine rebuilds. Certainly, this is for racers only. How will we rate the filters? To rate the filters in a meaningful way, they must be rated by some convention. Let us borrow Ohm’s Law from physics. While ohm’s law has applications mainly with electricity, it can be applied to many other examples. Ohm’s Law states that Voltage = Current * Resistance. With hydraulics, let Voltage = ∆Pressure and let Current = Flow Rate. Then, Resistance = ∆Pressure (PSI) / Flow Rate (GPM). The filter with the least resistance within the usable pressure ranges will be the best choice from an efficiency perspective. What oil will we use in the filter test? The service manual for my 2005 Honda CBR600RR suggests the use of SAE 10W-40 motor oil. That would be the obvious choice for the test if it weren’t for one fact: the engine typically operates at 80 degrees Celsius (176 degrees Fahrenheit). If I do not heat the SAE 10W-40 to this temperature, the test oil will be far too thick to get any reasonable numbers or value from. Rather than use SAE 10W-40 and be forced to heat it up to this great temperature, an expensive and arduous task, I will use different oils. SAE 10W-40 on average is 100 cSt@40C and 14 cSt@100C. A straight line graph can be used to figure the viscosity of the oil at 80C. cSt@80 = cSt@100C + 20*(cSt@40C - cSt@100C)/60. So the viscosity of the SAE 10W-40 at 80C is 42.6 cSt. So, the goal is to use an oil that has a viscosity of 42.6 cSt@21C (70F, room temperature). Conveniently, Generic Dexron III ATF is very close to perfect. It has viscosities of 34 cSt@40 and 7 cSt@100. This corrects to 42.5cSt@21C. Sweet!!! 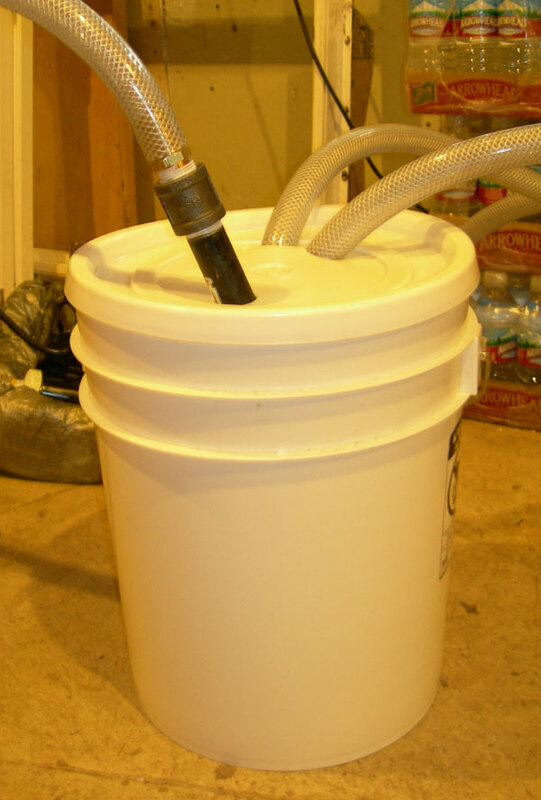 I will be using Valvoline ATF Dexron III/Mercon from a gallon container (#VV357). This choice is based solely in that it is the most economically available ATF from my local Kragen. What pressure should the oil be supplied to the filter? 90 PSI. Close to actual operating pressure. Which filters should first be tested? Since my interests in this study lay mainly with filter applications for 2005 Honda CBR600RR motorcycles, I will choose several filters that physically fit the bike. The stock filter, # 15410-MCJ-003, has an outside diameter of 68mm with a height of 70.5mm and a thread of 20x1.5mm. Extended filters, ?? ?mm length, will fit so I will cover those as well. Some filters are considered superior to others and have grown in favor among the motorcycling community, so I will try to start with some of these. Aside from the stock filter, Honda # 15410-MCJ-003 & #15410-MM9-003, my personal favorite has been the Bosch 3323, an over-sized filter whose construction appears to be top notch. Also, a Mobil 1 M1-110, a quality oversized filter. Another choice will be the K&N KN-204 / Hiflofiltro HF-204, this is a standard size filter, rather expensive, with great claims for it’s ability to flow and filter. I also hope to borrow a Scotts Racing filter to test. I personally do not believe in the use of these filters, but figure that a healthy comparison may discredit their use. This experiment is only the second one I have seen done by home tinkers. The first that I saw was from Ross Presta ( http://www.geocities.com/rfpxj/Oil_Filter_Experiment.pdf ). Other than the fact that this test was on spin-on filters to replace an internal filter for an otherwise antique bike, the test was rather crude and made 3 fundamental mistakes in my mind. 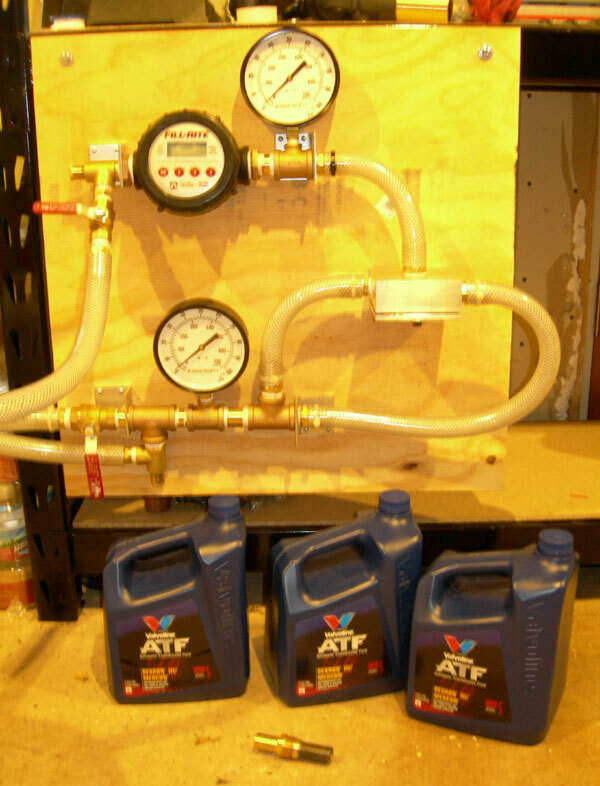 The first is the use of 10W-30 motor oil rather than Dexron III ATF. I spoke to Ross and he said that they were mostly concerned with startup flow. This is a fundamental mistake, as the test can only be useful when the filter is in full bypass mode. Since the bike they were concerned with must have had an internal bypass valve, this makes for even more problems. The second is the lack of back pressure in the system. In Ross’ experiment, the oil is able to flow back to the reservoir with only the restriction of the ¼” copper tube providing back pressure. I feel that more control is needed to ensure a real engine simulation. The last major problem is that the flow rate was determined by counting the volume of oil passing through the system by hand. I feel that by using an automatic counter, I can get far more accurate flow numbers, with errors amortized across a larger sample.